A larger update to the website is coming up. While I am getting it ready, I thought you’d appreciate a sneak preview. It’s the new theme that ABC is using for their coverage of the London Olympics. It is essentially the opening theme to GMA these couple of weeks and can also be heard on other ABC News broadcasts. For the two decades after the 1964 Winter Games, ABC made the Olympics a staple of their network and invented the way it is still televised today. The torch has since been passed to NBC which adopted many of the stylistic elements ABC pioneered, including the theme music. Bugler’s Dream by Leo Arnaud is synonymous with the Olympic Games because it has been used since the 1960’s by the network that has the broadcasting rights. For their coverage of the 2012 Olympic Games in London, ABC turned to DreamArtists Studios to capture the Olympic spirit. Given their background as concert orchestral composers, this was an assignment that played to their strengths. DreamArtists scored an Olympic theme package with an orchestra consisting of a massive brass section. There was, in fact, enough brass to fill 4 concert orchestras. Remarkably the theme was composed in only 24 hours. The result is a theme that is edgy and driving, with more percussion than Olympic themes at the other networks. The music reflects the truly grand scale of this world event. 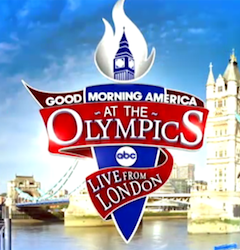 I Love This ABC News’ Good Morning America At The Olympics Theme From Summer 2012, Forever.